Where the Information Age Transcends Social, Political, Cultural, and Economic Boundaries. Food, Fresh Water and Electricity Without Fossil Fuels. What is needed to feed a population of 100,000 – 250,000 people? How much does it cost to produce electricity, clean water and food? Can this all be done in a sustainable fashion without fossil fuels? 21st Century technology is doubling its efforts to supply a rapidly growing human population. Current techniques for fresh water extraction and food production has exacerbated aquifers, rivers and lakes to the point of no return. For agricultural purposes, humans are extracting more water from wells and aquifers than is being replenished naturally by the water cycle. The unfortunate consequence of over-exploitation is that humans only start thinking of alternative methods of fresh water, food and energy production when natural sources have been depleted. In order to understand how technology is helping with sustainability, we must look to places where fresh water is scarce, but the sun and wind are plentiful. Places like Israel, Spain, Libya, Saudi Arabia, California, Australia and China have shortages and droughts of fresh water for human consumption and the agriculture industry. I will briefly describe some of the costs affiliated with creating a system that is relatively eco-neutral in that less atmospheric contamination is produced and water is conserved and recycled more so than current methods. The CIA world fact book is a database that includes specific information about each country ranging from natural resources, electricity consumption, military capacity, geography, to imports and exports. It is a reliable source to compare data between countries. It currently states that 75.3% of all electricity in the United States of America is produced by fossil fuels, 9.7% from nuclear, 7.6% from hydroelectric, and only 5.3% from renewable sources. The renewable sources of electricity production include wind power, solar power and geothermic power. It is no secret that Americans consume more energy, more food, more water, and contaminate more than any other people on Earth (though the United Arab Emirates is catching up). It is said that if the whole world lived like Americans, we would need 4 Earths! Not all geographical locations are the same, nor have the availability of natural resources, but countries like Nicaragua, Germany, Spain, Iceland, Denmark and Portugal all produce between 20% – 40% of their electricity using renewable resources. Germany, which receives significantly less sun per year than the USA, produces more solar energy and exports more solar panels to countries weening themselves from fossil fuel-based energy sources. An ideal and sustainable society is very complicated, but we can ameliorate atmospheric contamination and over-exploitation of fresh water by including new techniques to the energy and agricultural industries. For coastal cities in arid or semi-arid territories, a desalinization plant is a great way to preserve underground aquifers. Over-exploiting wells can cause environmental disasters that include sinkholes and salt water intrusions. In the southeast part of Spain, in a city called Carboneras, is where the largest desalinization plant in Europe is located. The province of Almería, where Carboneras is located, is one of the driest places in Europe. It is also home to the largest concentration of greenhouses in the world. The province is home to a ¨sea of plastic¨, greenhouses that cover over 80,000 acres of land and exports food to a number of European countries. The province is also home to more than 640,000 people, all of which need electricity, food and fresh water in the desert. The desalinization plant at Carboneras, Almería cost about 121 million euros to construct ($158,768,335 Sept. 2, 2014). It provides water for 7,000 hectares of greenhouses (17,297 acres) and a maximum of 200,000 residents. The desalination plant uses a lot of energy. The figures range from 1kwh/m3 – 2kwh/m3 (per cubic meter) of water. The electricity for converting brackish water into fresh water is currently generated by a coal-fired plant. The plant converts sea water into fresh water using a reverse osmosis method, which uses a membrane to physically “strain” the salt water. Price estimates vary from 0.50 euros – 1.0 euros per m3 for consumption. Coal and petroleum-fired plants are clear sources of atmospheric contamination, and are subject to fluctuating international price markets of import and export of fossil fuel. A cheaper and cleaner way of generating electricity for a desalination plant would be wind, solar, or even wave power (using ocean waves to do work). Roscoe Wind Farm in Texas has 634 wind turbines that produce enough energy for 250,000 homes. This wind farm was once the largest in the world and cost about $1 billion to install. It produces about 781.5 MW (megawatts) of electricity. Above: Andasol solar power plant in Guadix, southern Spain. A revolutionary solar power station located near Guadix, Spain, called Andasol Solar Power Station is a parabolic trough solar power station. This solar farm uses a parabolic mirror to focus solar energy onto a tube, which in turn, heats water flowing through it. The heat or steam can then be used to power machinery or move a turbine. It also contains a system that is able to generate energy during the night using salt water. 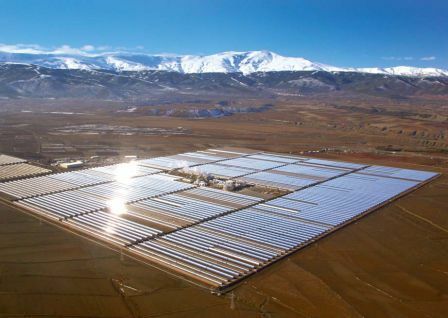 Andasol Solar Power Station cost 900 million euros ($1.1 billion) and can produce 165 million kilo-watt hours of electricity each year. To put it in perspective, about 450,000 people currently benefit from the energy produced by this station. It will reduce carbon emissions by 150,000 tonnes per year when compared to coal-fired energy plants. This is a significant victory for clean and renewable energy industries for future endeavors. In agriculture, intensive greenhouse horticulture is becoming more popular, more sustainable and more profitable than conventional agricultural methods. Popularity comes from the agriculturist’s ability to have more control over aspects of cultivation ranging from wind, humidity, nutrient absorption, water use, temperature and pests. They have been able to reduce or eliminate chemical pesticides for pest control by using simple sticky paper, insects, arachnids and other arthropods that eat fungi or other insects. New substrate and hydroponic systems allow for agriculturists to recycle water and use less fertilizer. In a hydroponic system, the water is continuously recycled in a closed system and the water solution does not seep into the soil. This prevents fertilizers from entering the local water table, which can provoke unwanted environmental reactions like algae blooms. A water recycling system also reduces water use in that it is not “lost” through the soil. Above: Campo de Dalías, El Ejido, Almería, southern Spain. 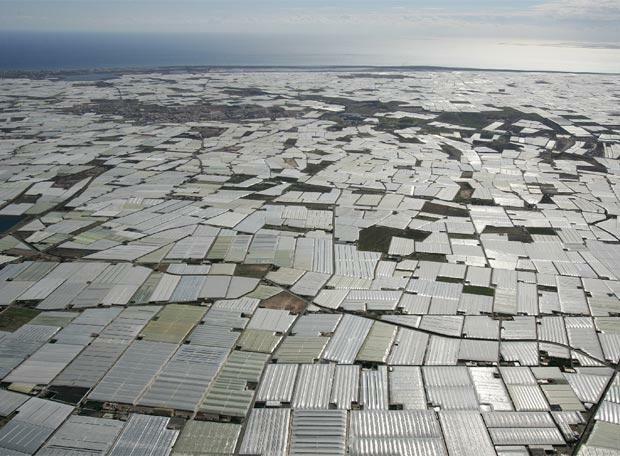 Part of 100,000 hectares (247, 105 acres) of greenhouses overlooking the north Mediterranean coast. Intensive agriculture projects like those in Campo de Dalías and Campo de Níjar in the southeast corner of Spain is said to also reduce global warming because of its design. The greenhouses are painted white, a technique used in southern Spain, especially with housing, to reflect the solar intensity away from buildings. The glimmer of the greenhouses in the Almería province helps to reduce the overall temperature of the plants it harbors as well as the surrounding territories. Compare the white, energy-reflecting greenhouses to the vast and expansive black-top parking lots in the United States that absorb so much energy. If they would only equip all American parking lots with sun-shade solar panels – not only will it keep your car cool from the hot summer heat, it will produce enough energy for the building you are about to walk into. As new technologies and cost-effective materials are tested, the increase in food consumption and human population does not necessarily have to degrade our environment. In traditional farming, soil is the primary medium from which crops grow. In monoculture farming, each year more fertilizer must be applied and depending on the water source, salt deposits begin to accumulate, which causes a reduction in crop yield. To avoid the environmental and production risks to crop yield, intensive agriculturalist have turned to substrate materials. Substrate is a growth medium, either organic or synthetic that replaces soil. Hydroponic growth substrate varies from place to place and is still being developed to produce the cheapest, but most effective growth medium. Some greenhouses in Spain and other parts of the world use grow bags, rockwool, perlite, vermiculite, sand, and coconut fiber. Coconut fiber is great because it is organic and is usually a bi-product, or waste product of the coconut industry. What was once “garbage” is now a viable medium for the agricultural industry. These techniques must be embraced if we are to ensure our food, water and energy needs in the present and in the future. So in the end, how much money will it cost to produce enough food, electricity, and fresh water for 250,000 people in a semi-sustainable way? I would estimate about $3 billion. At about $1 billion for each industry, $1 billion for solar/wind power, $1 billion for desalinization plants, and $1 billion to produce tens of thousands of acres of greenhouses that can sustain perhaps an even larger population than current methods. Implicating this three-pronged system can do wonders for impoverished areas of the world that struggle to survive from international donors. It has been studied may times that international aid to places like Africa have actually made things worse. Places like Algeria, Nigeria, Angola, South Africa, Congo and Ethiopia are well endowed with natural resources like petroleum, natural gas, minerals and metals, but the profits from these industries cannot support their current populations. They must harvest alternative energy in order to change the political, social and economic landscape of the continent. They must, in addition to meeting electricity needs, convert to clean energy for agriculture, so that, the African continent can industrialize, engage in infra-continental agricultural trade, and maintain its status as the least contaminated continent in the world. International paternalism restricts the local economy from developing in that it gets flooded with international products, which are sold at a cheaper price than local products. $3 billion is a lot to develop wind parks, solar parks, desalinization plants and thousands of acres of greenhouses, but it is far cheaper and more effective than the $50 billion in international assistance the continent receives each year. The more international aid that goes to the African continent, the more impoverished and more destitute the people become. The wind, sun, and ocean are three resources that are renewable and ecological sources of energy that will eventually triumph over fossil fuels, therefore, it is best to begin now before the wells dry up. We are only limited by our lack of investment and interest. Only through environmentalism and social ecology can 21st century humans be able to meets our energy and sustenance needs, which in effect, reduce our impact on the climate and environment. Only sometimes is death preventable. Sometimes knowingly, mostly unknowingly, we engineer dangerous societies with flawed socio-structural elements that are designed to push certain groups of disenfranchised people to the periphery. The lower class are limited by economic, educational, and representational boundaries, which are supported by the suburban middle class who vote for these policies. Those living at the periphery fight against one another because they compete for the little resources that have been left for them. The the “center” is off limits, because it is being guarded – this is where legislative, political and economic power control the elements of the state – the semi-failed state. Gun violence in the Americas (with the exception of Canada) from the United States to the tip of Argentina and Chile is very different than gun violence in Africa, Europe, Asia, and Oceania. It differs in the motives behind how gun violence is distributed and executed and the prevalence of such. The similarities between Old World Guns and New World Guns is that it all comes down to who controls the territory, space, land, turf, region, zone, state, country, caliphate, community, block, city, roadways, access, building complex, county, town, island, trade route, port – and above all natural resources (money). Although robberies could account for much of the world’s use of firearms illegally, the Americas have the problems of heavy drug trafficking and the drug war which makes up part of regular, day to day gun violence. The flow of drugs through the Americas normally flows South-North and ends up into the hands of North Americans and Europeans to be consumed. The citizens of the United States of America consume more illegal drugs than any other country in the world. Brazil, Columbia, Venezuela, Mexico and everywhere in between has been plagued with intense violence from gangs who amass their empires and personal protection from the money generated by the drug trade, extortion and bribery of police forces. The illegal gun trade is just as much a part of the illegal drug trade in that one is needed to protect the other – they go hand and hand. Central American and Caribbean countries suffer a great deal from the drug trade because of their geography. It is a narrow passageway for cartels coming up form the South American mainland. At about 82 homicides per 100,000 residents, Honduras has the highest murder rate of any country in the world. Nicaragua, Guatemala and El Salvador are also stretched thin by narco-trafficking and violence, which has caused a humanitarian crisis that is the irregular immigration of children to the United States. The current war-like levels of violence and armed conflicts in Central America was propagated from the foreign policy campaigns under Ronald Reagan and George H.W. Bush who supported the Contras (anti-leftist commandos), in covert operations and coup d’etats against left-wing ideologies including Marxist-Leninists, Communists, or any political fraction in support of Che Guevara and Fidel Castro’s revolution. Reagan authorized the CIA to help fund and train the Contras to fight against the Sandinistas in Nicaragua. And who can forget the U.S. invasion of Panama in 1989 to dispose of Manuel Noriega, former CIA employee, and narco-trafficking military dictator. The U.S. government effectively helped to establish Latin American drug cartels with out-of-work Contras who before fought against leftists. The Iran-Contra Affair of the 1980s was real, not a fabricated conspiracy, which highlights how little we know about how deep these operations run in Latin America. The drug war continues in mysterious ways as the U.S. government helps to create some of the chaos, especially with their “Fast and Furious” operation of 2006-2011 in which the Bureau of Alcohol Tobacco and Firearms (ATF) sold weapons to those they believed were tied to Mexican drug cartels (in an attempt to “track” them). Eventually those same weapons began appearing at brutal crime scenes in Mexico, and the Mexican government was perplexed as they were not informed of these American operations. As American police crack down, drug prices go up, the cartels make more money, they buy more guns, they become more violent, then they control more territory. Drug cartels continue to look for newer routes for transport of guns and drugs, which at times causes the violence to “bottleneck” in small countries like Honduras, El Salvador, and Jamaica, which have the highest rates of homicides (per 100,000 people) by guns in the world. Jamaica has become especially violent since cocaine and other drug shipments have diverted to travel through the Caribbean via Jamaica. If drugs were legalized or at least partially legalized, drug cartels would have less demand ergo less money to fund their armed conflicts. Or Americans and European could stop doing drugs all together, which will never ever happen. In Europe and Asia gun violence is far less prevalent than in the Americas. Legislation in these geographic areas generally only permit gun purchases for hunters and law enforcement officers. In Spain for example, if you want to buy a shotgun, you have to get a hunting permit, hand guns are rigidly regulated. In the United States, buying a gun doesn’t require much of anything besides money. The United States Constitution states that bearing arms and forming a militia is part of independence and homeland security, therefore, gun-ownership is a cultural thing in the United States. It is a direct result as to why there are about 88 guns per 100 Americans, making the United States the most gun-packing nation on Earth. It might also shed light on why cities like Chicago boast 500 homicides a year, the majority of them being gun-related. High gun related homicide rates in U.S. cities over 100,000 people are common – they shouldn’t be. Some countries in Europe have relatively high gun ownership rates, but don’t suffer the amount of gun violence present in the Americas. A European capital like Madrid, Spain, which has a population similar to Chicago (including metropolitan zones) suffers from only about 30 homicides a year, with only a fraction of them being gun related. Oceania, which includes Australia, New Zealand and island nations in Pacific, have similar gun related homicides to Northern Europe. In the United States on the other hand, it is not uncommon to hear a story about a single police officer who shoots a person 90 times. Crime and police protection with the theme of race and ethnicity are part of what make America an unsafe place for minorities as they are treated differently than European Americans. In 2002, police officers in the United States killed about 313 African-American men. Gun violence and police execution of a minority group has been calculated as “Every 28 hours a Black man is killed by the police in America.” Gun violence comes from those who have completely lost their sense of humanity – it’s the mechanization of murder. In Asia, China and Japan have effectively gotten rid of gun violence. Japan has almost 1/2 of the U.S. population (128,000,000 est. 2010) crammed into an area equivalent to California, yet might have about ~2 gun-related homicides per year. Buying a gun in Japan is an enduring process, there are strict limitations on the type, there are psychological and metal exams, a course must be taken, and it is subject to government inspections. In China, private possession of firearms is practically forbidden for citizens. The lack of guns and lack of gun related violence are clearly related, but the subject is more complex in countries less industrialized. One of the main things that separate gun violence in the United States to gun violence in Europe and Asia is culture. Americans feel the need to have a gun because it was instrumental in carving out the North American continent in a Wild Wild West fashion, whereas Europe and Asia have older nation-states that were conquered by marriages, diplomacy, trade routing, epic battles with swords, cannons and mammoths crossing the Swiss Alps; in Europe and Asia, they have other ways of having fun besides shooting at things in their back yards, or shooting at people in their front yards. The continent of Africa and the Middle Eastern region have some gun violence, but these current “Old World” conflicts are New World Order endeavors. Ancient African and Middle Eastern kingdoms were cut out centuries ago the same way kingdoms were formed in Asia, India, and South America until they were abruptly invaded, and geographically redrawn by Europeans in the 18th,19th, and 20th centuries. Current places like India, Pakistan, Nigeria, Algeria, Sudan, Egypt, and Israel were all cut up by the British and the French who ignored cultural, linguistic and ethnic elements when they crammed different people into a states. Conflict zones like Syria, Libya, Sudan, Mali, Israel, Yemen, Pakistan and more, require guns and armaments to be sent from Western nations (i.e. North America, Europe and Russia). As these zones become flooded with more weaponry, the violence continues as new fractions seek to redraw the lines that were left there by the Europeans in the first place. It is a revolving door of violence, but the Westerns nations profit the most so long as the guns keep firing. Though it might seem simple enough as to just restrict firearm availability to reduce firearm homicides, it might not be that simple. If people want to kill each other, they will do it. In South Africa, where the homicide rate is higher than in the United States, firearm homicides account for only 45%, while in the United States the rates is about 67%. There are deep-seated social problems that lead to friction between groups of people. The availability of firearms only exacerbates social tension of lack of resources. What is certain is that in the Americas, where many countries are at “peace” , they have just as many or more casualties, as current war zones. These problems must be addresses as to not coerce the governments of the Americas to deploy futuristic, dystopic, and Orwellian permanent military police who will monitor the streets with tanks, machine guns and stun grenades. The police states pre World War II of the 20th century were bad, the police states of the 21st century will be worse. If I Buy Freedom and It Doesn’t Work, Can I Return it and Get My Money Back? I as a former resident of Torrington, Connecticut, United States of America, since 2001 would have contributed about $6,812 to the wars in Afghanistan, Iraq and beyond. The website nationalpriorities.org has been tracking the U.S. cost of war since 2001 and allows Americans to see how much of their tax dollars, down to local populations, have been contributed to the efforts overseas. 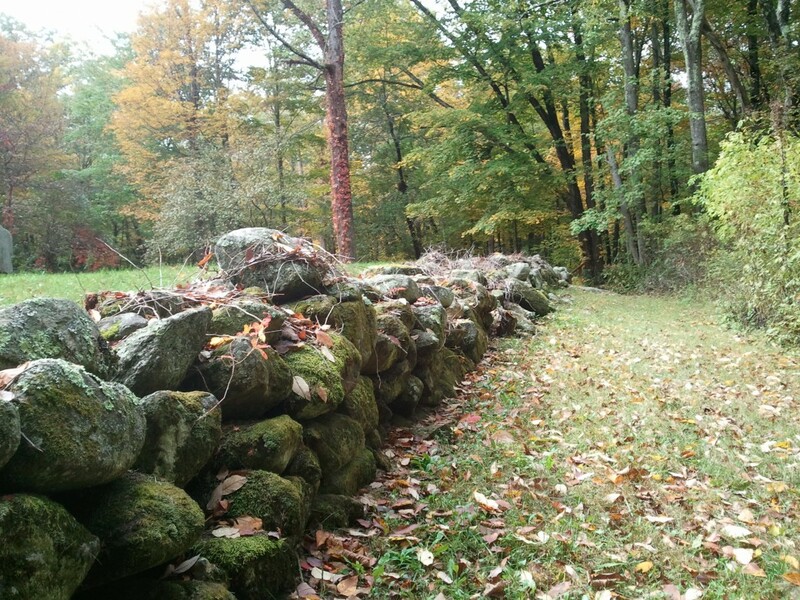 Torrington’s citizens since 2001 have paid out $119,212,900 (15-aug-2014) to a multiple-front war. Since there are about 35,000 residents in Torrington, and about 1/2 are working or paying income taxes, 1/2 of all Torringtonians have contributed over $6,000 to the war on terror. But the real question is are we safer now because of the war on terror? Have we made the world safer? Is the war on terror actually producing more terrorist organizations? How long until it’s finally over? Since September 11th 2001, there has been a liquidation sale on “freedom” worldwide when then president of the United States, George W. Bush and his administration, soon announced a global war on terror. At first the cross hairs were focused on Afghanistan, Al Qaeda, the Taliban and their sympathizers. Then, Bush decided to put Osama Bin Laden on the back burner and continue what could be seen as a Bush family legacy – Iraq. The American military’s focus switched rapidly to Iraq, where the regime of Saddam Hussein was suspected to have had weapons of mass destruction and links to Al Qaeda. Before, during, and after the deposition of Saddam Hussein, investigators claimed that Iraq did not possess high caliber (nuclear material) weapons of mass destruction nor had been working with Al Qaeda. In fact, Al Qaeda and other extremist groups were natural enemies of Saddam’s regime. If Osama Bin Laden and Saddam Hussein had been working together, why would they have kept it secret? Their unity would have been seen as a sign of strength in the region. Luckily, their distinct ideologies did not allow for a military or political union – their conflicting personalities and dislikes were greater than their hatred for the United States. Under current president Barack Obama, who more or less has been progressive concerning local and social matters within the USA, has not only continued the legacy of Bush-era military campaigns, but has amplified a seek-and-destroy, extrajudicial drone program that could be considered crimes against humanity. Yemen, Somalia, Afghanistan, and Pakistan are what I would like to call “Drone Zones” in that no real formal declaration of war has been made, but are part of a continuous bombing campaign in which civilians are unfortunately part of the casualties. These bombing campaigns are simply not effective in changing hearts and minds. Whose ideology is going to favor Westerners when their neighbor, perhaps a civilian, had been killed by them? Spreading democracy doesn’t come from without, but from within. So what is freedom in 21st century terms? Which country is most free? Is freedom being able to do literally whatever you want? Or is freedom being able to have social and economic mobility in the form of one’s access to a good education, housing, food, medicine, and other facilities or amenities that First World inhabitants encounter with less difficulty. Spreading freedom and democracy as part of a bombing campaign can be seen as a vice, like any other, freedom is aggression, anger, addiction, greed, censorship, gluttony, hatred, hysteria, lust, perversion, vanity and wrath. Although this may not be our ideal of what freedom is, the countries that suffer from “American Freedom” by way of military operations, heavy policing and lengthy occupations, fear cultural infiltration or annihilation. Freedom, by way of material objects, is in a sense purely economical, in that freedom is for the rich; oppression is for the poor. If you live in a conflict zone, and you are rich, you might have more freedom to leave, through legal means or not, than a poor person. If you live in a country where women’s access to reproductive services are restricted, as a rich person, you might have the freedom to travel to another country where women’s reproductive laws are different. This is not to say that a poor person cannot escape a conflict zone or access healthcare, but the pyramidal structure of modern and post-industrial human society shows that the upper echelon of society, the wealthy and powerful, are the ones who make and break the laws. Materialistic freedom in terms of commodities is not universal. Human beings are political property of the state in which they were born, reside or had resided. A stateless person is one who has no rights, and paradoxically has total freedom, yet no freedom. On the other hand, something like spiritual freedom is closer to universality in that one’s beliefs and thoughts are tangible within one’s mind, where no one else can truly restrict their beliefs, whether they practice them or not. Spreading democracy and freedom after the Second World War was a bit different than how it is done today. After Mussolini, Hitler, and Hideki Tojo were disposed of, and the war had been won by the Allied Forces. After obliterating the Axis Powers, the Allied Forces wanted to help their former enemies rebuild and prosper – and they did. Italy, Germany and Japan became stable economic powerhouses in which their citizens currently enjoy high personal income, well developed infrastructure, universal healthcare, stable borders, and relatively few internal conflicts that lead to deaths or executions. The citizens of these counties are generally considered to be free. The Second World War cost the United States more than 4 trillion dollars (in 2014) according to some estimates. After about a five-year campaign, the U.S. and its soldiers were treated like true liberators, like “winners” of WWII. They are still considered the greatest generation of humans to ever walk the Earth. As we fast forward to 2014, after 10+ years of war in the Middle East, combining the conflicts in Iraq, Afghanistan, all military operations, and everywhere else terror resides, 4.4 trillion dollars is the current cost of war (total cost of all services related to conflicts), and Americans are not treated as liberators, nor winners, and things are worse now than when we started. What does the future hold now that Hussein, Bin Laden, Hosni Mubarak, Colonel Muammar al-Gaddafi, and other life-term dictators have been disposed of? Will the countries of Libya, Egypt, Afghanistan, and Iraq become economic powerhouses like Germany, Japan, or even South Korea? Not likely. The reason: the war economy. Peace and stability is just as important a factor to the global economy as war and conflict zones. Now that there are currently more heavy conflict zones since before the U.S. and Allies’ invasion of Afghanistan and Iraq, defense contractors are making more profits and bigger sales than ever. For the profit-driven industry of arms dealing, shame from not being able to reduce violence and bring about stability after a military campaign is less important. As long as the guns are firing and the bombs are dropping, there is profit to be made. Therefore, it is conducive to the industry to provoke or procreate areas of conflict. It is even better if they could sell arms to both sides of the conflict through conspiracies and inside deals. If both sides have the same weapons, one will be forced to upgrade. With respect to dark-horse terrorist organizations with plenty of cash, the rise of ISIS or the Islamic State of Iraq and the Levant is currently driving a wedge in concurrent conflict zones in Iraq, Syria and Lebanon. They plan on taking over territories that roughly stretch from Morocco to India, to eliminate all borders between “Islamic” countries – high hopes for a group with few allies and many enemies. Current conflict zones: Somalia, Iraq, Iran, Lebanon, Syria, Nigeria, Mali, Columbia, Qatar, Saudi Arabia, United Arab Emirates, Israel, Palestine, Jordan, Turkey, Kurdistan, Pakistan, India, North & South Korea, China, Japan, South Sudan, Mexico, Egypt, Ukraine, Russia, Central African Republic, Libya, and many more, including the United States. As military hardware reaches a level of surplus, state and local police forces worldwide have been either given or have been purchasing this equipment. In the before mentioned conflict zones, it is not uncommon to see the military acting as a civilian “peace-keeping force” (like what we have seen in Tahrir Square, Cairo, Egypt). Yet in recent years, many countries like Spain, Italy, Malaysia and the United States have riot police or S.W.A.T. (Special Weapons And Tactics) who use military equipment on a regular basis to intimidate and scare local populations from demonstrating, protesting, and having their voices heard. This is an undemocratic way of maintaining social justice and order in that people will get the sensation of an authoritarian police state – people will stay home, be complacent and compliant, and be afraid to speak ill of the government for fear of persecution. This makes the U.S.A no better than the countries it invades to “spread democracy” if it continues to terrorize its citizens. As the world has recently seen how the recent events in Ferguson, Missouri rang out and connected with other oppressed people as distant as Palestine, it is important for all people to try and invest in other industries, besides the arms trade, that aim to save lives, not take them. Recycling Everything is Good For The Economy and The Environment. Recycling is a noble and necessary cause for industrialized human societies. The problem is that people generally forget about the devastating effects of solids floating in our oceans, the exponential growth of landfills, and the excess of energy needed to produce more and more physical products from scratch. Since 1/2 of world´s 7 billion people now live in cities and urban areas, the garbage we produce is concentrated in landfills in which a mountain of material wealth is buried and forgotten. City dwellers see some of the garbage dispersed in the vast landscapes of concrete and steel, which looks a bit unattractive when not placed inside the trash containers, but when the trash is inside the containers, which are always filled to the brim, they are taken away and sent to who knows where – out of sight and out of mind, and we continue to throw potentially useful material away. The idea of garbage, waste, rubbish, trash or whatever you want to call it, is useless to the Earth in that products made out of plastic, rubber, metal and glass will not disintegrate for it to use; that is why we as humans should recycle and continue using them. The problems people face in advanced and industrialized countries with regard to recycling might not be their fault. The problem is that there is a general lack of innovation and lack of profit-driven advancements in the use of recycled materials. There are no universal methods for recycling in many places. Just look at any state, city or town in the United States: There is a different method and process for garbage and recycling collection in each municipality. This also occurs in some places in Europe in that there is no universal method or financial resources for collecting all that is recyclable. Some towns collect and recycle batteries, cooking oils, used cell phones, organic materials, some towns have public ashtrays (so cigarette butts don´t float among the streets), some towns don´t recycle at all, some have organized a weekly collection of large household furniture, etc. The lack of universal practices within individual states and countries make recycling an impossible task for most people. 1) Make it illegal to not recycle: Fining people for not recycling is not a new idea, but not recycling is much like throwing garbage in the street, which also carries a punishment of a fine. 2) Containers: If people have the resources, they just might use them. Organic material, plastic, glass, paper, metal, electronic equipment (including batteries), oils, and cloths (clothes, furniture cushions, etc) seem to be the majority of the things city dwellers throw out. It seems like a lot of different containers, but the initial sorting these materials could be profitable later on. 3) Innovation: Scarcity and abundance of materials is wealth – like having fresh water and good soil in the desert. The amount of food and organic material that is thrown out by people who live in areas with an abundance of sun (i.e. Southern California, southern coast of Spain, Arizona, and Egypt) can be used as compost for agriculture if treated properly. In the ¨sea of plastic¨ or ¨Europe´s salad bowl¨ in southeast Spain, there are cultivars of tomatoes and cucumbers who use the discarded husks or hairs of coconuts as a growing medium. It is an organic solution to recycle a material that normally would be buried in a landfill. An unorthodox but innovative way of recycling comes from Sweden in that they incinerate some of their garbage to produce heat and electric energy for homes. Sweden recycles 96% of its rubbish while the remaining 4% is put in landfills, which eventually gets used. They recycle so well that they actually have to buy garbage from their neighbors to continue producing energy for heating by incineration. Electronic material, which is probably the wealthiest item city dwellers constantly throw into the trash, is very easy to dispose of, but difficult to recycle. The amount of components that make up something as complex as a computer, mobile telephone or television: precious metals, glass, plastic, wiring, and rubber, make it so much more difficult to recycle. This is why there should be a separate container and resources to recycle electronic materials. Much of the industrialized world´s electronic equipment goes to places like Nigeria and Thailand where toxic landfills are inhabited by local people who try to scavenge as much material wealth as they can. Places like Lagos, Nigeria, receives about 10,000 tons of trash, garbage, and potentially recyclable material each day. Although there is a community of people who live in a squalid shanty town within the landfill, they depend upon it, since they sell small quantities of useful materials, but it is simply too much garbage – and most of it is absolutely useless. The paradox with electronic equipment is that although we use less material, we produce more garbage. One example of this paradox is how far we have come technologically with television and computer screens. In the 1980s-1990s, television and computer monitors were heavy, bulky, and expensive. Now in the 2000s, monitors are lightweight, use less materials, and are cheaper. People are buying more computers than ever, and more than ever they end up in landfills. Compare cellular phones in the 1990s to cellular phones in 2010: Large, bulky, and expensive mobile phones from the 1990s were few; small, lightweight, and relatively cheap (except for the iphone) mobile phones in the 2000s are cheap and more abundant than ever. There needs to be a revolution in how we recycle electronic equipment or risk a pandemic in which places like the Olusosun Landfill in Nigeria become commonplace elsewhere. Imagine if each municipality, town or city had a massive recycling facility in which employees delicately sorted materials into different types of metals, plastics, glass, ceramic, organic material, wood, and electronic equipment. A facility of this type would create an almost endless source of full-time employment, much like the people to retrieve the rubbish in the first place. A better understanding of the materials that people discard will permit the exploitation of these materials again. Plastic bottles, although recyclable, are one of the most abundant items that end up in landfills. Architects recently demonstrated how many plastic bottles New Yorkers contribute to landfills by building a massive structure with them. Each hour, the residents of New York City throw out more than 50,000 plastic bottles instead of recycling them. The structure is large enough to shelter about 50 people. This project demonstrates not only how much recyclable material is wasted, but also what else can be done with these materials instead of simply throwing them out. Although Americans in the United States would like to think that it still leads the world in innovation, technology, and socioeconomics, it is evident now more than ever that it is beginning to lag behind its allies in Japan, China, Northern Europe, specifically Germany, and the countries of Scandinavia. Americans waste more than any other people on Earth. Culturally, things in the United States are bigger than in other countries (cars, houses, product packaging, etc) Predetermined obsolescence of cheap products is also a concept that keeps Americans buying, which also drives the economy. Marketing has a lot to do with the amount of garbage Americans produce in that packaging for small items is large so that it catches the customer´s eyes from a distance. The packaging for our blenders, x-box, mobile phones, televisions, baby toys, sunglasses, picture frames, tweezers, cans of tuna, boxes of cereals, and everything else people by from places like Wal Mart will be thrown in the trash. They must all be recycled along with styrofoam! What a retched material. Styrofoam is trademarked, whereas the non-brand name for this material is expanded polystyrene foam or EPS foam, whose name makes it sound like what it truly is: an almost impossible to recycle material. EPS foam for take-out foods should be regulated since it is almost impossible to recycle or biodegrade. Places like Oakland, Albany, New York, and San Francisco, have banned EPS foam for take-out foods. The alternative is to use paper containers which are both recyclable and biodegradable. The Cultural Shift Away From Transgenic and Genetically Modified Crops in Europe Could Be Bad Business for Spain. Transgenic and genetically modified crops can be bad for business in the long run due to a cultural shift and social awareness of the dangers of ¨American style¨ agronomic business practices in European Union member states. The reality of transgenic foods like the tomato is that some people, who are old enough to remember, notice that nowadays, tomatoes don´t taste the way they used to, nor have the same amount of nutrients they had say thirty years ago. One example of lost nutrients is how the polysaccharide (sugar) pectin, which is naturally produced and broken down by the tomato for ripening, is reduced in genetically modified versions so that a tougher skin can resist bruising during harvesting. Pectin in humans has been shown to add to our soluble dietary fiber and reduce blood cholesterol levels. In addition, some transgenic crops are grown in sand, which has very little nutrients, henceforth, they need to be added. So what are the real benefits of producing transgenic foods? In the past, some scientist praised genetically modified organisms in foods claiming that with the capacity to produce more food, with fewer resources, humanity could solve world hunger and reduce food prices. Economic history shows that there was plenty of food in the world before the advent of transgenic crops, the problem is that people die from hunger from the climate, spatial and economic reasons (drought, food is far away, or food is too expensive). According to the United Nations Environment Programme, about one-third of all food produced in the world is ¨lost or wasted¨. One can deduce that producing more food doesn´t necessarily reduce malnutrition or hunger, but the economic implications show that having capital, water and land are most important in combating hunger. As people in the Western world inform themselves better about the economic and environmental implications of GMO and transgenic crops, they will begin to shun them in favor of non-GMO crops that are not only more nutritious, but practicing ecological agronomics could potentially create more local jobs. Factory farms and transgenic super-plantations require very few people, are far removed from the general population, and require a lot of chemicals and machines. Why is it that the majority of the food people in New York eat come from California? – a distance of about 3,000 miles (4,828,km). Transgenic food has taken hold of the European Union in a market that culturally has been trying to maintain their alimentary sovereignty free from ¨American style¨ crop production. The member state that produces the most transgenic or GM crops is Spain. Genetically-modified maize (corn) and potatoes are currently the only two GM crops approved in the EU. Soya, tobacco, and even trial versions for GM pest-resistant olive trees are being considered for production in Spain. About 90% of Europe´s transgenic crops – led by U.S. multinational Monsanto´s MON810 corn – is cultivated in Spain. The majority of this corn is used as animal feed for the country´s famous meat markets (hogs, chickens, cow, etc). One problem farmers and consumers face is the lack of transparency and regulation in terms of what the farmers are feeding their animals, and what people are actually eating. It has been reported that farmers feed their animals a mixture of transgenic and conventional corn, which essentially disallows farmers to chose between the two. The lack of transparency also denies its citizens to know exactly where this transgenic crop is being grown. Most Spanish citizens are against transgenic crops and would like for them to be labeled, but the European Union law states that if less than about 1.0% of the ingredients are transgenic, it does not have to be labeled. As far as the philosophical implications of transgenic foods – namely corn or soya – is not so much as if it is used in society, but how it is used. Subjectively, I oppose the use of transgenic foods for human or animal consumption, but I have no problem if companies use transgenic crops for the production of ethanol, methanol, and other chemical compositions from transgenic crops. In the United States and Brazil, ethanol from corn (US) and sugarcane (Brazil) accounts for a large portion of combustible fuel production, replacing a significant amount of petroleum use, which contaminating slightly less than pure petroleum. The economic implications transgenic foods might have for Spain and other member states that allow transgenic corn like Portugal, Czech Republic,Poland, and Romania might not come immediately, but permitting cultivation of more crops besides corn and potatoes to be produced might have a backlash effect. Germany is planning on prohibiting all GMO crops within its boarders. As agro-business farmers in Europe are becoming ¨Americanized¨ in their acceptance of GMO foods, it could produce a schism in the way food is imported and exported in within Europe. Countries that are not part of the European Union, but form part of its economic region like Norway, Switzerland, Iceland, and Serbia have delayed their acceptance of genetically modified organisms. These countries along with Germany, see prohibiting genetically modified and transgenic crops as a scientific, economic and cultural an issue that has many people thinking that it is a bad idea. Though the evidence is hard to filter and difficult to prove that GMO foods are harmful to human health, one can take a look the North American diet and see how much obesity, heart disease, cancer, and other diseases are attributed to the foods that Americans consume. The United States is the largest producer and consumer of transgenic foods in the world – and to say that transgenic food has nothing to do with the increase in deadly disease in the USA is an understatement. If Spain continues to increment the amount of transgenic crops and feed to hogs, chickens and other farm animals, there might be a backlash in member states whose people culturally reject the importation of animals fed with GMO in foods. The idea of local organic triumphs over foreign and transgenic. As local regions in Europe begin to prohibit the cultivation, sale and distribution of transgenic crops, like The Free State of Bavaria in Germany, it can be seen as a way to strengthen local business and keep unpopular enterprises like Monsanto out of their food chain. Spain has the advantage of being the sunniest place in all of Europe, especially in the province of Almería, Spain, which boasts an average of 320 days of sun each year. It has been exploited for decades by local and foreign businesses (including Monsanto) in an area known as ¨The Sea of Plastic¨ (el mar de plástico). This desert area basically feeds europe during the winter as its climate permits crop growth all year round. If those in the Spanish agricultural business adhere to American models in food production there will be a decrease not only in the quality of food products, but confidence and trust in food products marked ¨Product of Spain¨. Since it is currently one of the top 10 agricultural exporters in the world there needs to be a cultural and economic shift to protect itself from transgenic foods. The Interesting Relationship Between Germans and Jamaicans: Resolving an Energy Crisis by Shedding Light on it. What Do Jamaicans and Germans Have in Common? History, Tourism, Sports, and Clean Energy: Jamaica is on its way to resolving its own energy crisis. The economic powerhouse that is the Federal Republic of Germany has an interesting relationship with the small island nation of Jamaica. The relationship is mutual in that Jamaicans and Germans have been working together on a few projects that involve government institutions, tourism and non-governmental organizations. From a historical point of view, there have been communities of ethnic Germans in Jamaica for more than 150 years. Where is the real connection between the two distinct countries? Jamaica was inhabited by what anthropologists and historians refer to as Arawak or Taíno peoples, who settled the islands in the Caribbean, sailing from the South American mainland, since before the common era. In 1494, during the second voyage of Christopher Columbus to the Caribbean, the island was then known as Xaymaca by the native Taínos. At first, the island was claimed by Spain until English privateers, corsairs, and pirates attacked Spanish vessels that circulated the Caribbean. In 1655, the Spanish lost the island to the English and until this day remains part of the British Commonwealth of Nations (hence Jamaica is an Anglophonic nation). When the English took over the island they continued – as the Spanish did – to exploit the land, and the people, to the point where they engaged in the use of imported slave labor of African peoples. Jamaica became one the largest exporters of sugar, rum and molasses (many indigenous Taínos were killed or died of disease as a result of the Spanish and English occupations). During the 1830s, after slavery was abolished in the British colonies, 19th-century scientific racism fueled racial bitterness that Europeans had after losing a virtually free source of labor. The British-Jamaicans therefore looked to Europe for cheap labor. Indentured servants from Europe essentially paid their way to the New World by agreeing to work in the British colonies for a number of years – among this group of indentured servants came a group of about 350 Germans to a Jamaican plantation. Since the 1830s, there have been Germans or “Germaicans” living in Jamaica. After a few generations of living in Jamaica, almost all of them have lost their German language and completely integrated as Jamaican people by culture, but their physical attributes look very much German (i.e., blond hair, fair skin, and freckles). For almost half a century, Jamaica has become a popular tourist destination for Americans, Britons, and Europeans. Jamaica has been popular with Germans from the spread of Reggae music and Rastafari, which was made popular by the likes of Bob Marley & The Wailers, Burning Spear and Peter Tosh. It is not uncommon to see Germans who have an affinity for deadlocks, ganja, and eating I-tal food. The exchange of cultural icons and interests are mutual in recent days as Jamaicans are surprisingly interested in the Germany national football team. Jamaicans love football(soccer), and support a variety of national teams, but one thing is for sure: Germany is a favorite. It is not uncommon to see that during the world Cup, Jamaicans are flying the flags of countries like Germany, Argentina and Brazil in support. The most important relationship Germans and Jamaicans have nowadays has to do with clean energy. Jamaica has been importing costly and highly-contaminating diesel fuel in order to generate electricity. There is a new initiative to ween Jamaica off petroleum by installing solar panels and wind turbines. The German Ministry of the Environment has been working with a few countries in the Caribbean to outline a plan to make sustainable or green energy more available. The Tourism industry, which has seen a lack of visitors to Jamaica in recent years, might get an upswing from new developments in clean energy cooperation from other countries besides Germany such as Spain and Cuba. The Grand Palladium Resort & Spa in Hanover, Jamaica is the largest photovoltaic (solar) plant on the island. This Spanish hotel boasts a capacity of 1.6MW from a solar roof-top system that uses photovoltaic cells manufactured by a German company called IBC solar, but installed by a local company called Sofos Jamaica based out of Kingston, Jamaica. The hotel expects to save about $730,000 each year in energy cost (not to mention the barrels of petroleum that will be saved). At a rate of 2.2 million kWh per year electricity production and 17,000 square meters of photovoltaic solar panels, Jamaica could essentially be petroleum free after building only about 1,000 of these facilities. Jamaica’s neighbor Cuba has also been trying to cooperate in the fabrication and installation of solar panels in their respective island-nations (instead of buying them from Germany or China). Not only will it reduce their dependence on fossil fuels for energy, but also create job opportunities in fabricating, installing and maintaining photovoltaic cells all over the Caribbean. Last but not least, the German Embassy of Jamaica has been making an effort to bring about self sufficiency for an educational center – an NGO in Cassava Piece, Kingston – with a donation of JM$2.1 million for the installation of German-made solar panels. A Jamaican-based company installed the German-made solar panels for HELP Jamaica! Educational Center. This system was installed in late 2012, and is probably the only NGO on the island that is powered with 100% clean energy. With the realization of a market open to innovation to solve its energy problems, it is interesting to see how Germans and Jamaicans have at least a few things in common. Cooperation in clean energy tend to bring countries together, unlike their rivals in the petroleum industry, which tends to drive a firm wedge between them. Are Reparations Still Relevant? Who Deserves it and When is It Acceptable? The controversial topic that debates whether or not monetary reparations are justifiable for people of African descent in the 21st Century. It might be too late for some reparations, but not soon enough for others. The question of whether or not European and American governments should give reparations for slavery to people of African descent in the form of money or land comes from a few different sources: African-Americans (in all of the Americas); Haiti, for declaring their independence in 1804; and the people of the continent of Africa, for the European Scramble for Africa. Every region of the world has experienced epic tragedies that involved the massive loss of human life in the most inhumane ways possible. In order to recuperate from past injustices of human culture, sovereign nations have been trying to readjust their societies in order to prevent dissent, violence and mass-murder, but when profits are to be made from chaos, consolidation of power, and human exploitation, morality takes a dive, and unethical laws are written in order to protect the ruling class from future prosecution. Using the logic of those in favor of reparations, there are a myriad of historical events in which those who had suffered, or their descendents, should also be given compensation for their suffering: The Nigerian Civil War, the Colonization of the Americas, Rwandan Genocide, Genocides in Armenia, Cambodia, and Bosnia are just a few examples of people being singled-out because of their religion or race, and subjected to imprisonment, forced labor and death. Reparation activists worldwide point to the fact that other peoples have been offered reparations by governments for forced labor, genocide, confiscation of lands, and for losing an armed conflict (war reparations). West Germany paid $35 billion to Israel between 1953 and 1992 in an attempt to pay for subjecting the Jewish communities to forced labor, “apologize” for the rise of Nazi Germany, and for how they were brutally and systematically round up, forced into concentration camps, tortured, and killed. They were stripped of all their assets, wealth, and above all, were subject to genocide as part of a fascist, anti-Semitic ideology. African-American reparation activists point to other examples of reparations like the Native-American community and their inclusion in the U.S. Government’s policy of establishing Indian Reservations and paying out millions of dollars to compensate for 19th Century Manifest Destiny land grabs. Reparations for people of African-American descent: Should it be a reality? The answer is, it should have been, but now it is too late. Those who had lived through slavery, or at least their children, were going to be honored a small compensation for their labor in the form of property ownership, one of the pillars of capitalism, but the U.S. Government at the time had a history of breaking promises not only to Native-Americans, but African-Americans as well. Considering that the British and U.S. Governments had broken over 500 treaties with Native-Americans over profitable and valuable land, African-Americans were also denied what was promised, especially those promises that were made after the American Civil War during what historians refer to as the Reconstruction Era. 40 acres and a mule was an agreement met between African-American ministers, abolitionists and Union General William T. Sherman, who promised to some 40,000 freedmen land and seafront property, which was confiscated from the Confederates. Sherman’s Special Field Order No. 15, which occurred shortly after the American Civil War, was a way to punish the South for their attempts at succession, attacking the Union, and to break the link holding the finances between southern slavery and the Confederacy (not because of 250 years of chattel slavery). The 400,000- acre strip of land from South Carolina to Florida could have changed almost everything about modern American society and race relations in terms of education, culture, equality, and wealth in the African-American community. The reason why so many people, black and white, are against reparations is that there is a cultural and temporal disconnect with previous generations in that Americans do not want to be held accountable, and are generally ashamed for their ancestors’ actions. Most importantly, in terms of the U.S. economy, the methodology of calculating and paying out 250 years worth of labor to descendents of Africans and African-Americans is culturally complex in that people will always contend whether or not some people of African descent deserve remuneration or not. Whether or not reparations should be paid out, it will never happen because there are conflicts between American culture and economics. The majority of Americans are against reparations. The idea of giving a minority group of people ¨free money¨ because of a past injustice might not have the effect one would think from a cultural point of view. Reparations for the people of Haiti: Should it be a reality? The answer is yes. The Haitian Revolution that resulted in the declaration of independence from France in 1804 came with extreme consequences. France demanded that Haiti pay 90 million gold francs for the loss of slaves and the French side of the island Hispaniola, which was called St. Dominique at the time, or risk another French invasion. From 1825 to 1947 Haiti continued to pay its “declaration of independence debt” to France, which was estimated to be more than $20 billion. Decades of economic warfare by the international community; the coup d’ état, which was suspected to be supported by the U.S., France, and allies; and the 2010 earthquake, which killed 100,000 civilians or more, were all recent events that have further crippled the sovereign nation of Haiti. At the very least, Haiti’s external debt was cancelled amidst the devastating earthquake, and $9 billion was giving in relief efforts, but it still falls short of the $20 billion that was extorted from Haiti post-independence. Reparations for the people of Africa: Should it be a reality? The answer is yes, but not in the form of a simple payout. Reparations will come only in the form of true socioeconomic development. But first, bribery, corruption, and theft of capital must be identified, exposed, and dealt with in a way that prevents net wealth from leaving the continent. An obvious, but not popular solution to corruption and embezzlement is transparency. Being able to track the flow of money between companies, governments, and banks will better inform the public of how their labor is paid, taxed and redistributed. To prevent government leaders from funneling money back to the U.S. or Europe, limiting the amount of money one can have in foreign bank accounts could help. However corrupt dictators may seem to the Western world, there are always enablers (Westerners) who permit this collusion of foreign aid by giving Africa money with one hand, while robbing with the other. During the past few decades, government-to-government aid has not worked at all for economic development on the continent. Although the continent receives about $50 billion in aid each year, it is estimated that $1 trillion is stolen each year. Most of that money ends up right back in Europe, the United States, and island tax havens. One of the best ways for economic development is to stop foreign aid as Zambian-born economist Dambisa Moyo describes in her critique of decades of failed policy. Economic development cannot occur if local markets are flooded with free goods that could be produced locally. Agriculture and manufacturing take a big hit when products are routinely sent to Africa. One might think that it is generous to do so, but it effectively puts local companies out of business. Moyo offers another simple example of how foreign aid is having a reverse effect. In order to properly gird these concepts into the theme of reparations I must say that foreign aid to Africa does not count as reparations. The scramble for Africa by European powers in the 19th and 20th centuries absorbed all but two (Ethiopia and Liberia) sovereign states into their empires, and the amount of wealth that was stolen by declaration of war against indigenous people continues to this day with the extraction of minerals and precious metals and the round-the-clock coup d’états that occur with the help of Western interests. The exigency in which raw materials are extracted from the continent to be sent to manufacturing plants in the European Union, China, U.S.A. and Russia, leave very little to be circulated within the continent – the flow of raw materials needs to be diverted inward. The best kind of reparation high-income nations can give to Africa is to offer something tangible like renewable energy in the form of wind turbines and solar panels to help with their energy crisis. Combining the aforementioned with proper water irrigation systems and desalinization plants are also other true forms of economic development in which all citizens could eventually build upon and stabilize their societies. Only then will much of the conflict areas soon turn into places with cultural standards in which subsisting on foreign aid and pity will be a thing of the past. If John Brown Were Alive, Could He Help in Ferguson? John Brown: Mártir y Terrorista, Héroe y Villano. Violencia con Armas de Fuego: El Viejo Mundo v. El Nuevo Mundo. The Positive Correlation between Women in Parliament and Standard of Living in High Income Nations.